The argument for every motorist to own a car diagnostic code reader continues to strengthen. On this page we'll focus on an inexpensive automotive scan tool with an amazing array of useful features while maintaining a price point well below $50. I'm going to take this a step further and walk you through the features and the benefits of two separate units I specifically own. The first car scanner we cover is of the handheld variety. 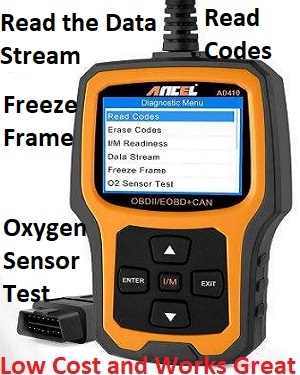 I picked the Ancel AD410 enhanced OBD II vehicle code reader to have around my house and for personal use. I have a few things in the negative column to discuss about this tool. And since people like hearing about the bad stuff we will cover this extensively. 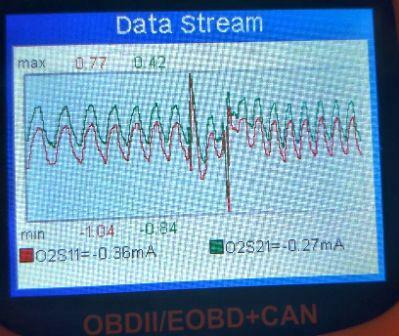 With that said, it's amazing that you can hold a sub $50 tool in your hand capable of reviewing the data stream. In addition, not only can you see that data stream, but you can also take a snapshot of it. This becomes extremely helpful with intermittent malfunctions. You can literally take snapshots of the data stream as the failure occurs and review this captured information off of the automobile. If that wasn't enough, you can also graph the data. Let me tell you why this is important to anyone who owns or drives a car. As modern automobiles age we're seeing an increase in the failure rates of sensors and actuators. As an example, it's common to find a bad coolant sensor on a Chevy. When you own a reliable car diagnostic code reader not only can you extract the trouble codes, but you can also pull up the coolant temperature on the data stream. If that sensor reads -30° on a hot summer day you need a new coolant sensor. The part costs around $20 and it takes about 10 minutes to replace. The fact you had your own automotive scanner just saved you a boatload of time and money. On the fix my old ride website we talk about fixing problems on older cars to get more time and miles out of them. When a car rolls past the 10 year 100,000 mile mark poorly designed and often plastic components start to fail in higher numbers. In many cases we're talking about the failure of sensors. As an example, you can see car and truck owners having problems with the Chevrolet crankshaft sensor. 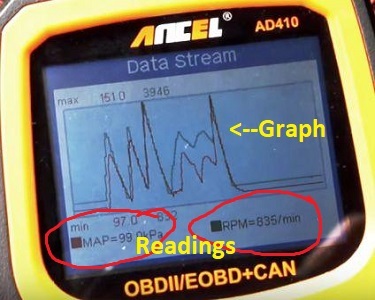 Not only does this malfunction set a specific code, but you can pull the cranking RPMs up on the data display of the Ancel AD410 enhanced OBD II diagnostic tool. As you crank the engine around, you should see varying numbers between 500 and 600 registered as the cranking RPMs. If you see zero this indicates failure of the sensor itself. Let me point out another interesting feature of this car diagnostic code reader. This tool also reads pending codes. A pending code is a computer detected system malfunction. However, the programing doesn't consider the issue consistent enough or serious enough to turn on the check engine light. A lot of these codes that you find in the pending section often have to do with evaporative emission system problems. A lot of people call these gas cap codes or even nuisance codes. Intermittent problems can also set pending codes. In this scenario the onboard computer system has decided to keep an eye on things and not notify the driver until another failure occurs. Vehicle manufacturers made these improvements after years of complaints about over sensitive check engine light parameters. If you own a code reader with the ability to read pending codes you can look for these advanced warnings. In the next section we're going to talk about all the bad things about the Ancel AD410 handheld, automotive scanner and then we'll talk about two car diagnostic code readers that fall into the Bluetooth category. These types of OBD scan tools plug into the diagnostic port and send the data stream to a smart phone application. It's fun talking about all the bad stuff about any given car diagnostic code reader. There's no getting around the fact that the cheaper tools offer fewer creature comforts for the end-user. As an example, the first thing you do when you connect the AD410 is navigate the opening menu screen. It's at this point it becomes painfully obvious this isn't a touch screen diagnostic tool. In the defense of the unit no automotive scanners at this price point have a touch screen. Therefore, when you're in the menu area you use the keypad arrows to highlight the desired window and then press the enter button. That's how you navigate with this tool. The next thing people find aggravating becomes the testing features not supported on some automobiles. In other words, don't buy this tool because of the O2 sensor testing function. It does work on some vehicles, but far from all. I ran into evaporative emission system tests also not supported on many automobiles. Those tests would help diagnose fuel tank pressure problems in Chevy cars and trucks. Another aggravating feature remains the code lookup screen. In this function it's difficult to enter the code number because the keypad doesn't have any numbers on it. This means using the arrow buttons to scroll up and down in the different positions to hit the exact diagnostic trouble code number. When you finally achieve the entry, the definition returned becomes the same one you would see on the read code screen. In other words, the scanner already has on screen definitions for set trouble codes. Not only is the code lookup section difficult to use, I don't see why they have it, if they don't plan on helping or providing more information about individual trouble codes. Here's an example of diagnostic support information on this page about common Ford EGR valve codes. Finally, here's the other problems with this scan tool. It's too small and it can't read transmission, anti-lock brake and supplemental inflatible restraint codes. After reading the previous section some might wonder why I like this car diagnostic code reader if it has so many shortcomings. The reason is based on the price and the reliable features. Although the tool has its shortcomings in several areas, it does a few things just as well as more expensive units. Due to an updated low-end processor the tool works and navigates quickly. You can't say that about all of the bargain priced scan tools in this category. The data stream and the graphing function worked on every automobile I tried so far. 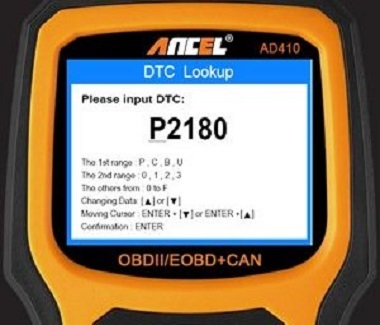 If you look at the Ancel line of automotive scanners you'll see code readers for less. However, I would prefer to pay the extra $10 to have access to the advanced features of the AD410. If you poke around Amazon you'll see that the Autel Auto Link AL319 is currently the number one selling scanner at the time of this writing. Unfortunately, it's just a code reader with no data or freeze-frame capabilities. Even if you don't think you'll use the advanced functions now, consider the possibility you might want to learn how to use them at a later date. In other words, this is a car diagnostic code reader that has room to grow as your automotive troubleshooting skills increase. Speaking of the ability to grow, this tool comes with a USB cable that connects to a PC or laptop. This allows you to update the automotive scanner and also print out reports. These remain two functions I haven't explored to their fullest on my own unit yet. With that said, with over 1,200 reviews from verified purchasers I don't see people complaining about these features. This leads me to my last point. Read through the positive and negative reviews about the different devices so you won't be surprised by what you receive. Just because I recommend this automotive diagnostic tool for myself doesn't mean it's right for you. Although the handheld car diagnostic code reader market continues to make progress, they dedicate most of the development energy toward the Bluetooth style automotive scanners. I'm sure the popularity of the smart phone has a lot to do with it. A friend of mine has a product from blue driver that offers a complete solution in this automotive smart phone space. You buy the Bluetooth diagnostic port and it provides instructions to download an application to your phone, tablet or personal computer.. It's a pretty slick operation and the scanner works well with the software. For me, I wanted to experience the Bluetooth automotive diagnostic revolution without spending a hundred dollars. This is why I went with the BAFX wireless automotive scan tool. This becomes yet another best-selling car diagnostic code reader tool on the Internet at the time of this writing. However, this device doesn't come with the software. Instead I downloaded a free application called torque. This allowed me to review the data stream sent from the BAFX wireless scan tool. After a few weeks of using it, I decided to upgrade to the paid version of the torque Pro application. At the time it only costed five dollars. In addition, other companies produce smart phone software applications to review data from the Bluetooth automotive diagnostic scanner. Here's The bottom line for me. I want people to understand that when the check engine light comes on it's not time to panic, but instead time to gather information. Plugging a car diagnostic code reader into your automobile remains no more difficult than plugging your cell phone into a charger. The information that a car diagnostic code reader provides can lead to inexpensive and simple repairs in some cases.